Phong Hong Bakes and Cooks! : Who? Me? Leng Looi? One day as I was making my way to The Embassy@The Starling, I heard a voice caling out "Leng looi! Leng looi!" Of course I ignored it. I mean. Me. leng looi. It couldn't be. Then a hand tapped my shoulder. "Leng looi, Nam Heong li tou?". 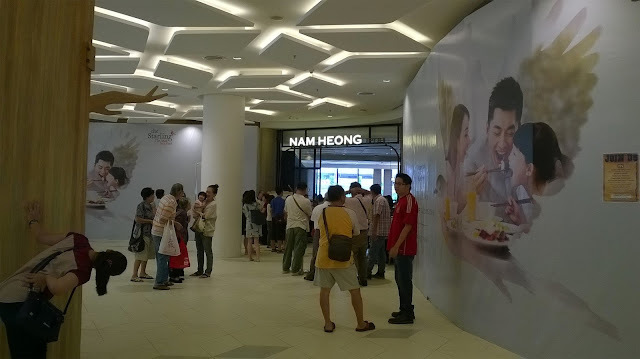 It was a group of little old ladies (which explained why I became leng looi) who were looking to yum cha at Nam Heong. So I pointed them in the right direction. 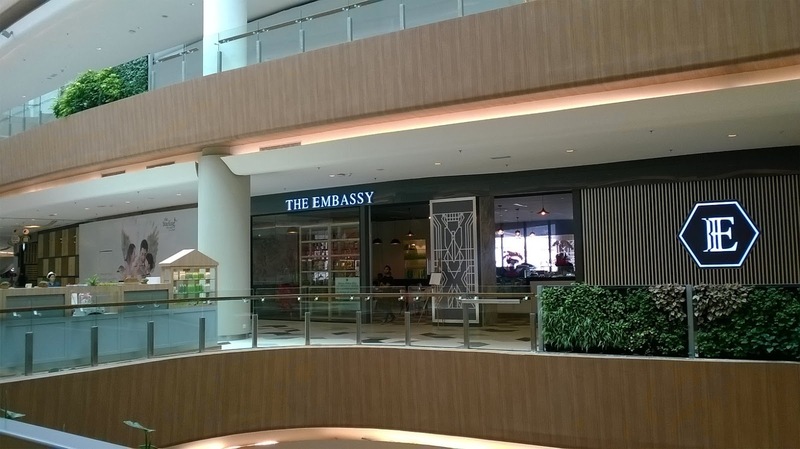 I was walking on air for a good 30 seconds when I caught my reflection on The Embassy's glass partition. That sent me back to mother earth with a resounding bump. It was nice to be leng looi for that few seconds. Bah! Anyway, this is one restaurant that is rather quiet whenever I walked past (not anymore at the time of writing). One Saturday past 12pm I passed by to check the menu. It was sad and empty unlike this other place that the little old ladies were looking for. There is a perpetual crowd at the entrance of Nam Heong. I guess it will take a while before I have a chance to dine there. 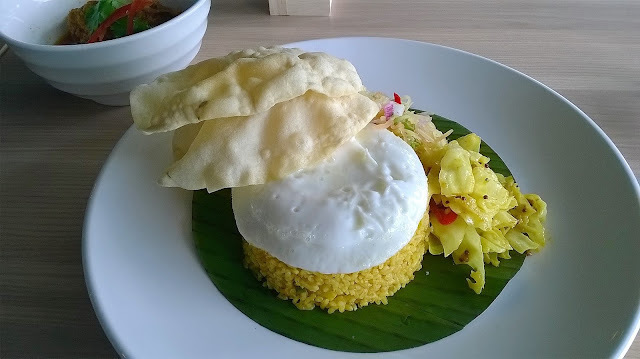 Coming back to The Embassy, I decided to pay a visit to try their Embassy Nasi Istimewa. I read good reviews and I had to try it for myself. 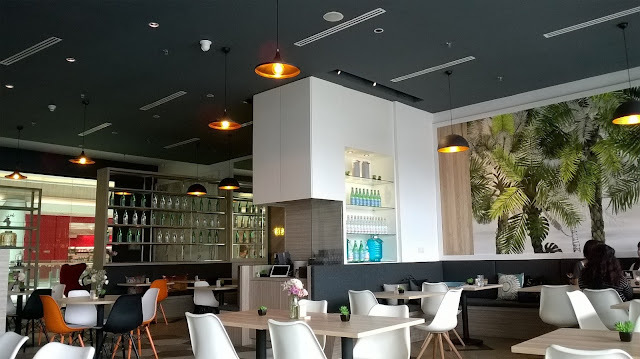 I like the decor and ambiance. It has that very warm cosy feel to it. A very nice place to hang out with friends. There's an outdoor seating too. Perhaps better for cooler days. 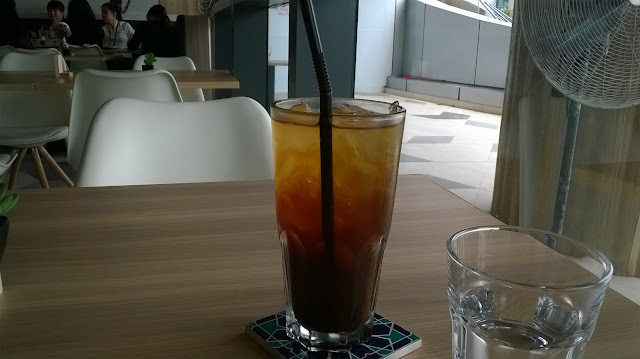 My iced Americano (RM9.00). Almost my default order at places that serve it. It was nice and strong. My Embassy Nasi Istimewa (RM28.00). It does not look appealing at this angle. Let me shift a bit. Unveiled. 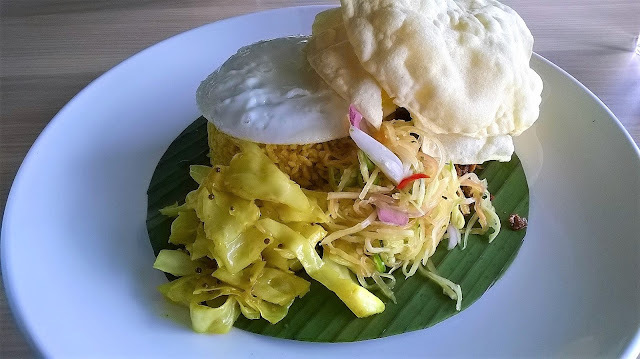 Pineapple fried rice with a fried egg on top, fried cabbage, mango kerabu and tempeh with ikan bilis sambal. 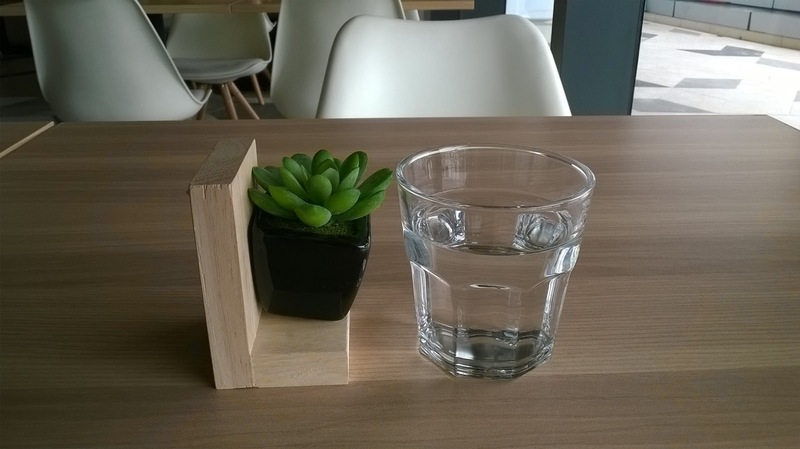 The Embassy gets top marks in terms of portion size. Imagine me struggling to finish the rice. I was thinking of brownies for dessert at first, but no, forget it. No space. So small eaters, it is best to share. 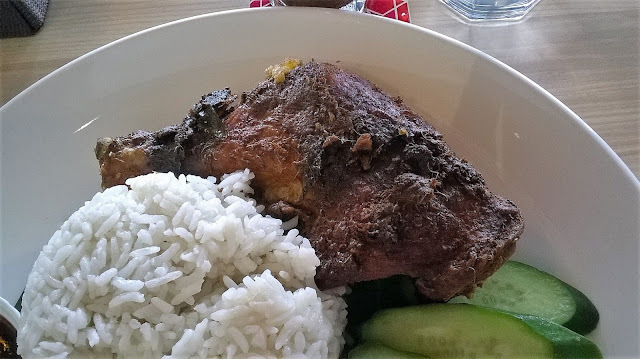 There is also a bowl of ayam pindang served together with the rice. So that made for a mighty fine lunch (Total cost RM40.70 inclusive of 10% service charge). But I will be honest. I will not be ordering this again. But I came back another day for something else. 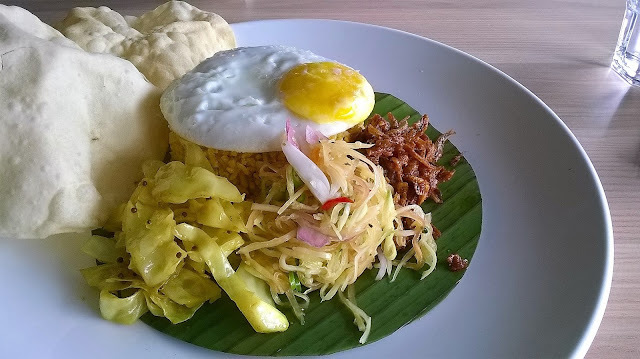 Nasi Lemak Kg Pisang (RM25.00). I was very hungry as it was way past 1:00pm. I usually don't eat so late but I just came back from a meeting. And I noticed the place buzzing with a healthy lunch crowd. Business is picking up. The nasi lemak was accompanied by one hardboiled egg, peanuts, ikan bilis, sambal, cucumber slices and one whole fried chicken leg (ayam goreng berempah). 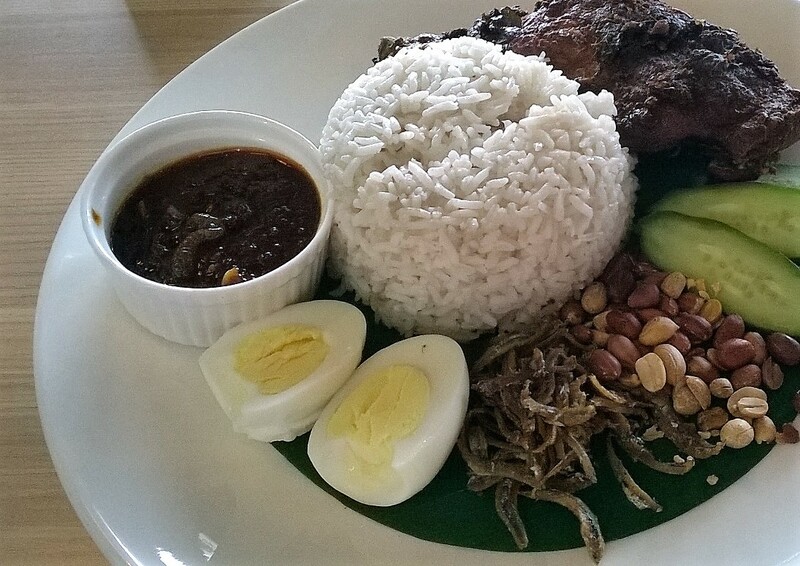 I must say that this is one very decent nasi lemak. Very fragrant with adequate santan. The sambal was good too and very spicy. 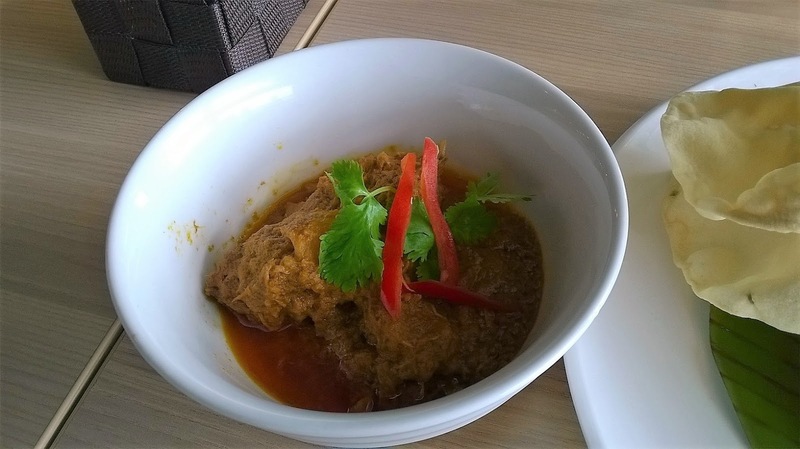 If you have are not into spicy stuff, you may find the sambal a bit too hot to handle. And what I like is that the egg yolks do not have that greenish greyish ring around it. Thumbs up for that. The ayam goreng berempah was served piping hot and it was crispy though the meat was on the dry side. 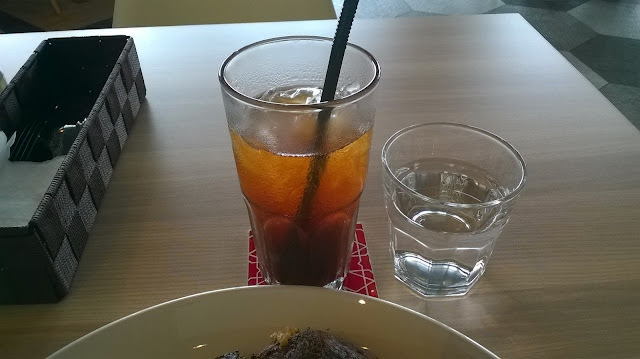 Again I had the Americano (RM9.00) which succeeded in keeping me wide eyed and bushy tailed throughout the day in spite of the carbo loading. The Embassy gets top marks again for portion size as I was more than satisfied after starting off with an empty tank. No brownies again for lack of space. Hmmm...next time I just come for the brownies. Total cost of this nasi lemak meal is RM37.40 plus 10% service charge. Next time, I will try the western menu. That is a very special rice with such name. Come, post your photo...let me see leng looi or not. Hehehehe!!! Good grief! Prices fit for an ambassador! Confirmed not leng looi hah..hah... I guess we have to pay for the overheads and nice setting. Ya lah, like perasan like that LOL! This place got nice ambiance and all that is built into the price. I like that plate of nasi lemak... so yummy ! Wah! 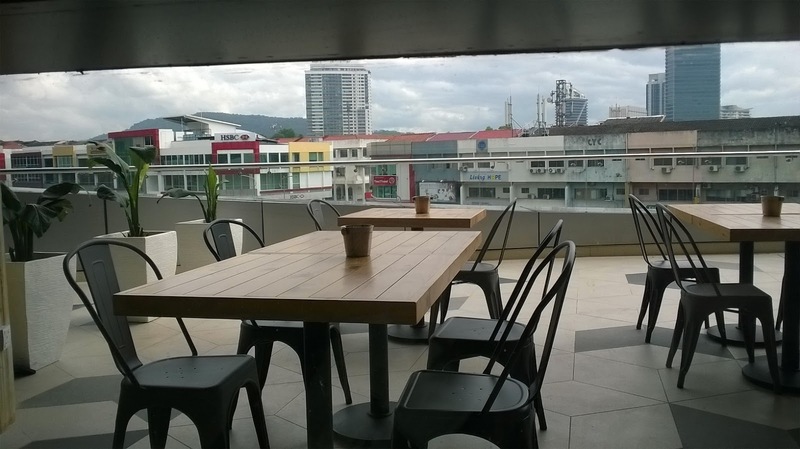 This one very atas place ni! No lah, where got leng lui. Already going to masuk 5-series LOL! Hey Leng Lui.... Amboi! Finally you confessed that aunties called you that. I am sure you are stunning, pretty and funny too. Come on, I am so transparent in my blog even though no one calls me Leng Zhai. So what? I cannot change my looks, so be it lah. Eh, no lah, don't get too imaginative. I am just an ordinary auntie. Those ladies are in their 70s, so to them I ma a spring chicken LOL! Aiyo kena stalk pulak. I know how you look like, so if I see you I will say hello. you must be pretty and sweet for old ladies to call you leng looi cos old ladies call me aunty instead when they are way older than i am. lol! from the price alone the meal is definitely for sharing. portion is big, i see a lot of rice and they gave you a lot of sambal too for the nasi lemak. the price is like serai's price. Oh no, to them in their 70s, I am considered a young girl LOL! Price wise, to be expected for a place like this. Fuyo.. Nasik lemak rm25?! !.bulat bijik mata SB tengok harga tu. Tempat cantik macam ni harga dia pun cantik LOL! Biasalah kat tempat2 macam ni, kita customer kena tanggung kos hiasan dalaman. 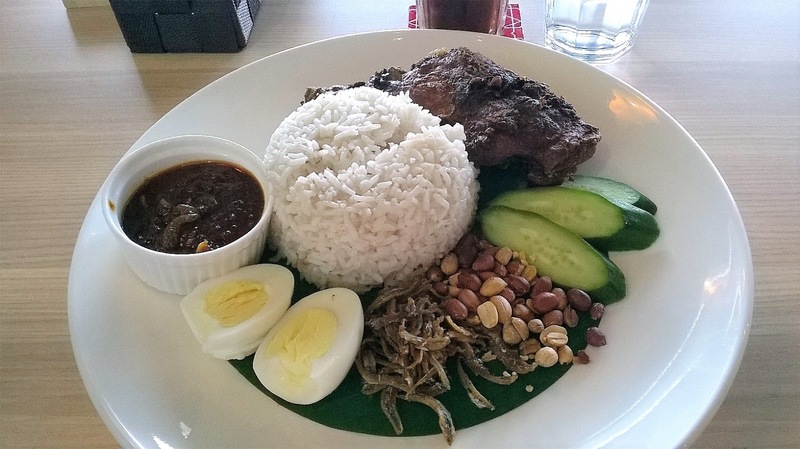 PH just try aje nak tahu sedap ke nasi lemak yang mahal hah..hah..
Hi Phong Hong, I have came across some senior ladies or gentlemen calling me 'leng looi' when they want to ask for 'favours'. Does make one feel happy to help. Hi Kimmy! Ya lah, they want to butter us up LOL! The portion sizes do not disappoint. A big eater like me found it quite a lot. Should have brought my container LOL! My next visit I should eat a salad and then brownies hee..hee... Ah, you get called leng chai too. I guess people just use leng chai/leng looi as a general name to call anyone who they feel is not quite uncle or auntie.